Sometimes, the best adventures are the ones you don't really plan on doing. After a relatively packed weekend in the Adirondacks, the thought of sitting in less traffic on the way home to Philadelphia made an early departure from the Adirondacks seem appealing. But at the last minute, we decided to take advice from the staff at Garnet Hill Lodge, where we'd stayed, and head up Peaked Mountain. 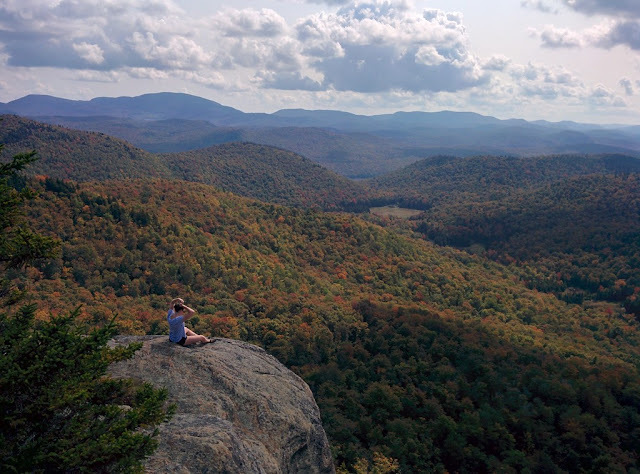 There are so many incredible hikes in the Adirondacks, and so many (relatively) tall mountains to climb, the odds of hearing about Peaked Mountain at all are pretty slim. Without a trip to Garnet Hill, we certainly wouldn't have. The 2,919' mountain, pronounced pee-kid, sits overlooking Thirteenth Lake in the Siamese Wilderness. It's one of a handful of many moderately-sized mountains in the area, and the 7.2 mile round trip is a perfect way to spend a few hours on a beautiful autumn day. Parking for the trailhead is at the Thirteenth Lake parking lot, which is also a popular spot to launch kayaks and canoes. If you're interested in skipping the first 0.7-0.8 miles of the trail, hop in a canoe or kayak and paddle down to the start of the yellow blazed trail up the mountain - just don't miss it! Starting from the parking lot, the route up Peaked Mountain traverses the west side of the lake, winding up and over rocks and small hills. We passed four NYSDEC campsites that looked beautiful, right on the lake, and turned up the yellow blazed trail after 0.8 miles, following Peaked Mountain Brook. Exploring around Thirteenth Lake on our way to the yellow-blazed trail up Peaked Mountain. Peaked Mountain Brook tumbled down the mountain at a low grade at first. Every once in a while, we'd spot what looked like a perfect shallow swimming hole and smooth rocks perfect for using as water slides. We gained elevation gradually, and after another 0.8 miles, we came to our first pond, one of a handful hikers see on the trail. The trail wound around the left side of the pond, and shortly after, we passed two more small ponds, one on our left and one on our right. Finally, after 2.1 miles, we came to Peaked Mountain Pond. It was beautiful, and looked more like a lake than a pond. We found another gorgeous NYSDEC campsite and brainstormed about occasions we'd have to come back and camp there. Looking down at Peaked Mountain Pond from near the top of Peaked Mountain. After skirting the edge of Peaked Mountain Pond, the real climbing began. We ascended about 600 vertical feet on the first part of 2.9 miles of hiking, and we had another 600 vertical feet to gain in the trail's last 0.4 miles. It was STEEP, and more characteristic of hikes of I've been on in the High Peaks. The going was slow, my legs were burning, and there were occasions where I had to use my hands. But as we popped out of the trees on to some of Peaked Mountain's slides and found the USGS marker at the top, it was absolutely worth it. We had stunning views of Slide Mountain to the northeast, the Siamese Pond Wilderness in all its glory to the south and west, and plenty more. The already changing leaves added pops of color to the otherwise completely green, mountainous landscape. 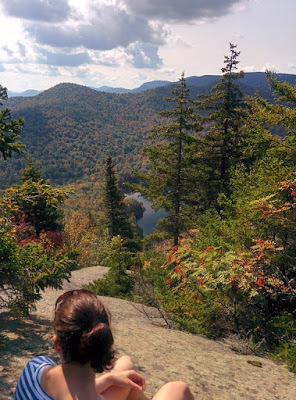 We retraced our steps back down the yellow-blazed trail, thanking our stars when the steep descent brought us back to Peaked Mountain Pond and the grade eased. The rest of the way back was fast, and easy for us. The entire route took us about three hours. 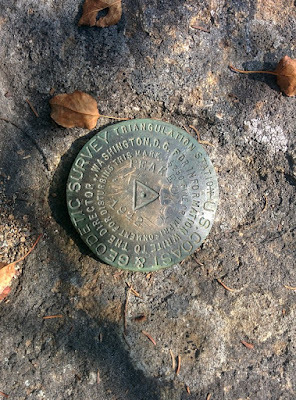 Looking for these on hikes is like treasure hunting! I've seen this hike's distance listed anywhere from six miles to eight miles. Unfortunately, we didn't have our GPS watch with us to measure the exact distance we traveled. I'd suggest planning for the longer end of the spectrum, just in case. Overall, the beginning of the hike could be rated as easy, but that last climb is a doozy. If you're not up for the climb, it's a really nice walk in the woods, but the climb is worth it. Wear shoes with good traction. There are stream crossings, but strategically placed rocks make them a piece of cake. Garnet Hill Lodge is awesome. If you're not staying at the lodge, visit for dinner after your hike. If you are staying, take advantage of the kayaks, canoes, paddle boards, and bikes available for (free!) guest use, and see the area in as many ways as possible. 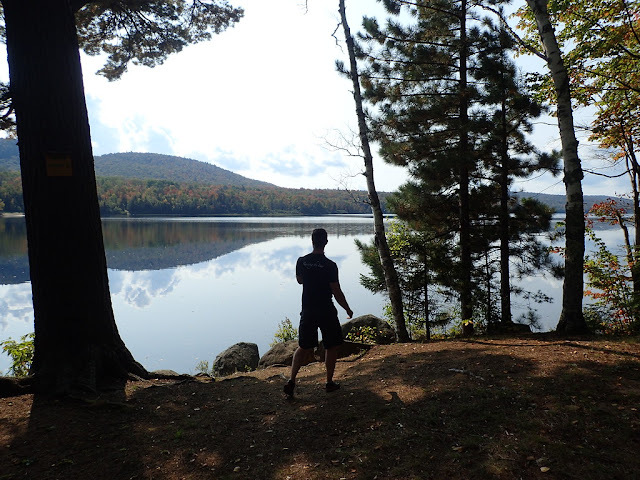 We hiked to Hooper Mine and paddled around the lake one of our days there - a perfect multi-sport adventure. 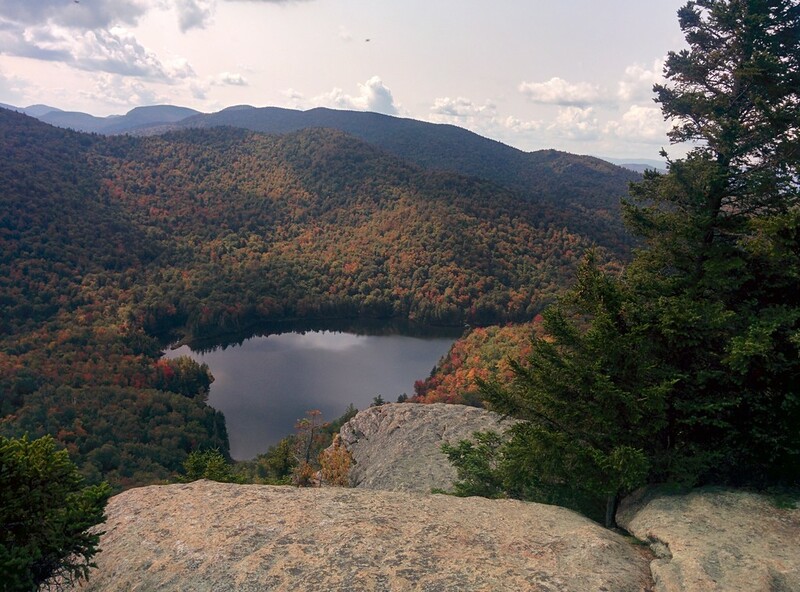 Have you been to Peaked Mountain, or this part of the Adirondacks? I'd love to hear from you in the comments!